This dribbling soccer drill is a fun dribbling game that focuses on both dribbling and defending. Players should be encouraged to dribble with their head up and once they are given the command they should dribble with speed to beat the defenders. The kids love this soccer drill! Assign 3 defenders to start in the smaller square. These defenders are limited to this square only and should come into the larger square while they are defenders. The rest of the players should be positioned outside the small square, but inside the larger square. Each of these players are dribblers and need a ball. Each of the dribblers should be dribbling around in their area. 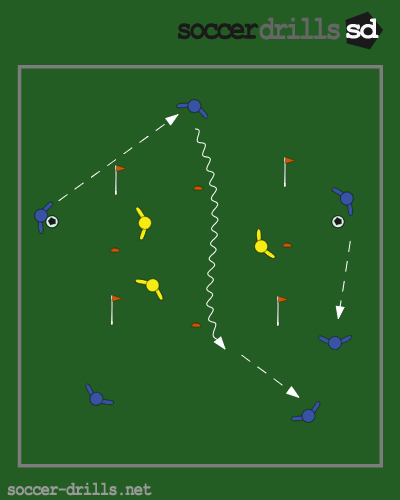 On the coaches command, the dribblers attempt to enter the smaller grid on one side and make it across the grid and out the small grid on the opposite side. If the dribbler makes it to the other side successfully without losing the ball they are awarded a point. If the dribbler is stopped by the defender they switch roles and the dribbler becomes the defender and the defender becomes the dribbler. If a player loses control of the ball, or kicks the ball across the line he becomes a defender and the defender that has been in the longest takes his spot. Encourage players to dribble with their heads up, keeping the ball close, dribbling with speed, and takin on the defender. Defenders should put pressure on defenders without diving in. A good low stance forcing the defender to the side and getting in close enough to get their hands in on the attacker.